My mum lives down in Cornwall, right near St Ives, which if you’ve not been is well worth a visit as it’s really beautiful, especially in the summer. It’s a lovely little seaside town with cute shops, delicious restaurants and stunning nearby beaches, so it probably comes as no surprise that I really look forward to visiting her down there when I can. Mr H loves it when I visit my mum too as not only does he get a bit of peace and quiet and the time to do whatever new DIY project he’s dreamed up that week, but I always bring him back one of Cornwall’s finest delicacies, some good old Cornish fudge. I don’t know why there is so much fudge in Cornwall but in the main shopping street of St Ives alone there’s about five fudge shops, with each one selling about a million different flavours. Mr H obviously has sussed them all out and has decided which shop is the best one, although I can never remember his favourite flavour (it’s something chocolatey though of course) so I normally bring him back a selection. Obviously the fudge they sell in these places is pretty much just pure sugar, so I felt inspired to create a slightly healthier version that doesn’t involve a ten hour round trip to bring home! 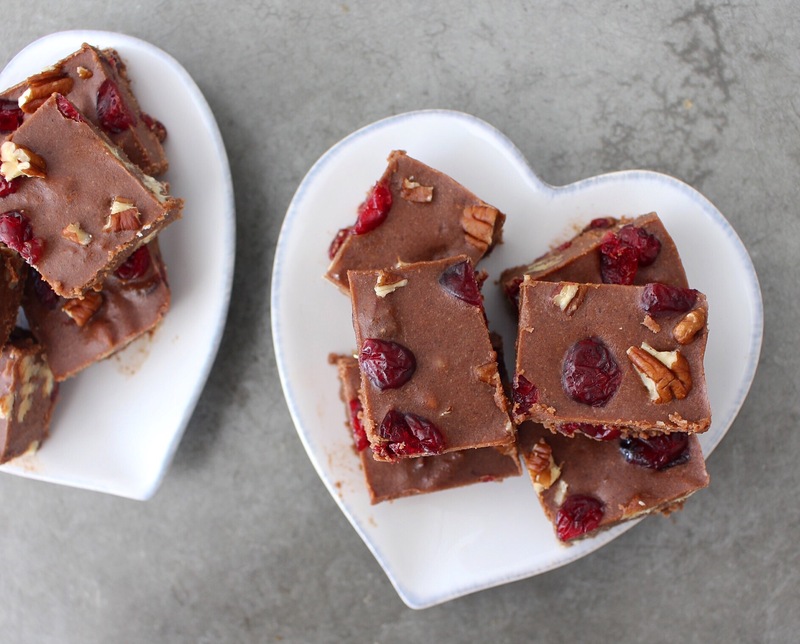 Just a hop, skip and a jump to the supermarket and you’ll be ready to get your fudge on. 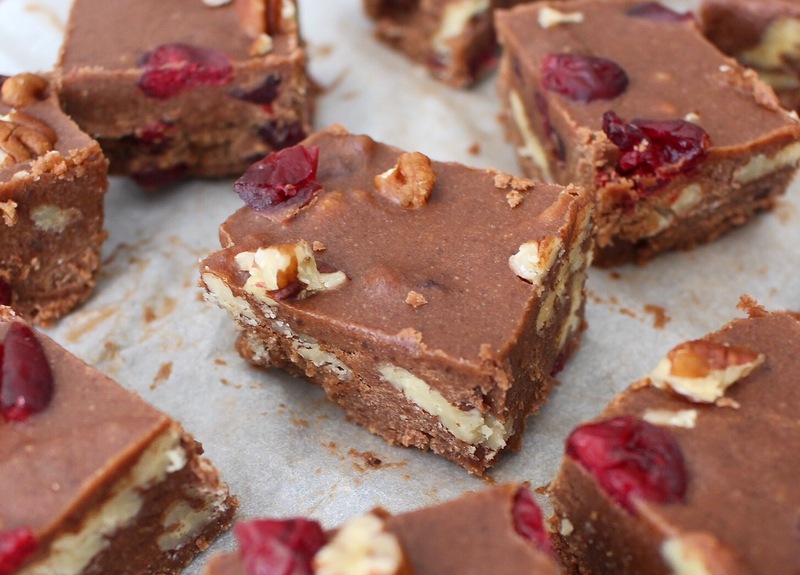 I’ve used cranberries and pecans to add a little fruity tartness and a bit of a crunch, but feel free to go all out and chuck in whatever you fancy! 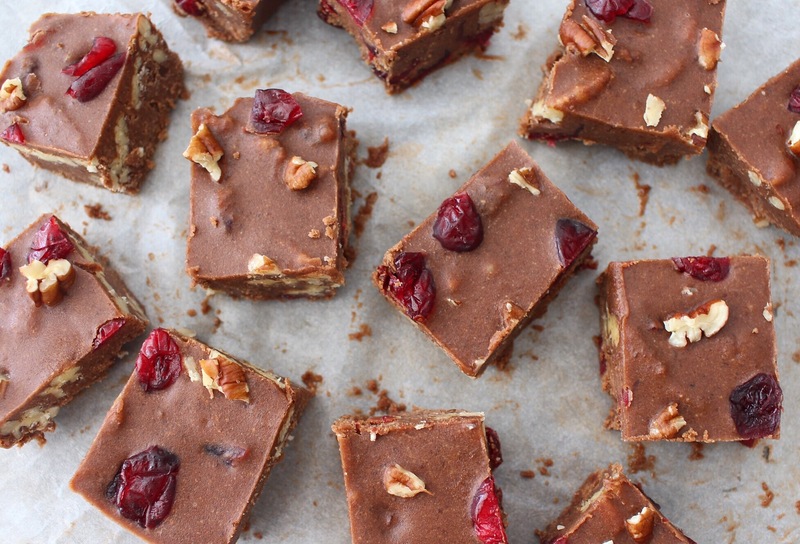 To make the fudge, pop the coconut oil, almond butter, dates and cacao in a food processor or high speed blender and whizz for a couple of minutes until the mixture is smooth and chocolatey. Stir in the cranberries and pecans, then pour into a lined baking tin or mould and pop in the fridge for an hour to set. Cut into squares and store in the fridge. And there you have it, how easy is that!